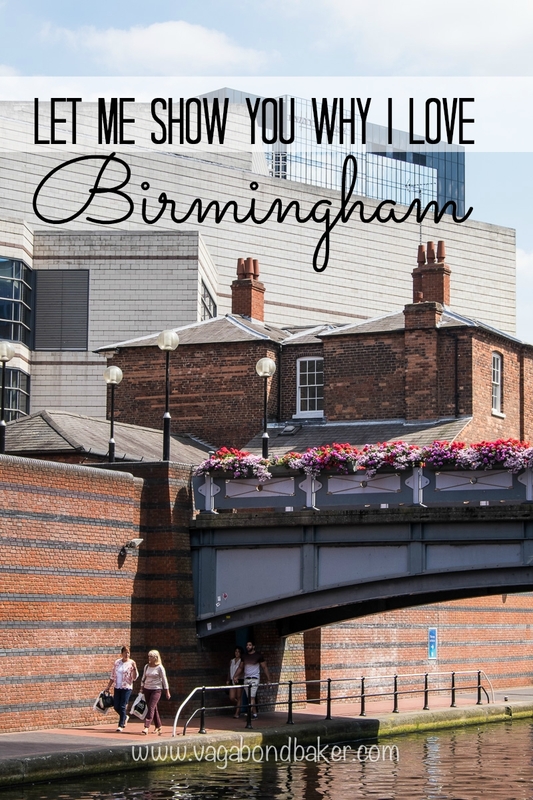 I grew up near Birmingham, it is a beautiful city! I know, it doesn’t have the glamorous reputation of some other British cities but it filled my heart in my teens. 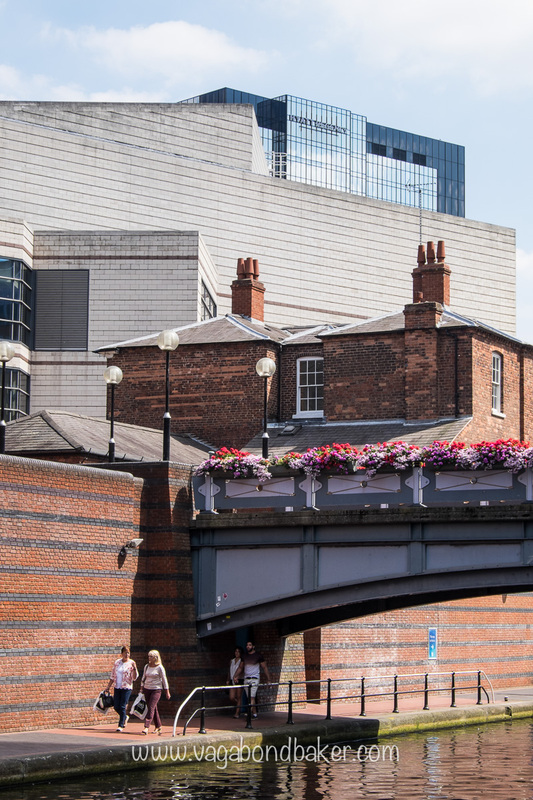 When I return, as I often do – my brother still lives in the area – it never fails to amaze me how Birmingham has grown even more lovely than I remember it. 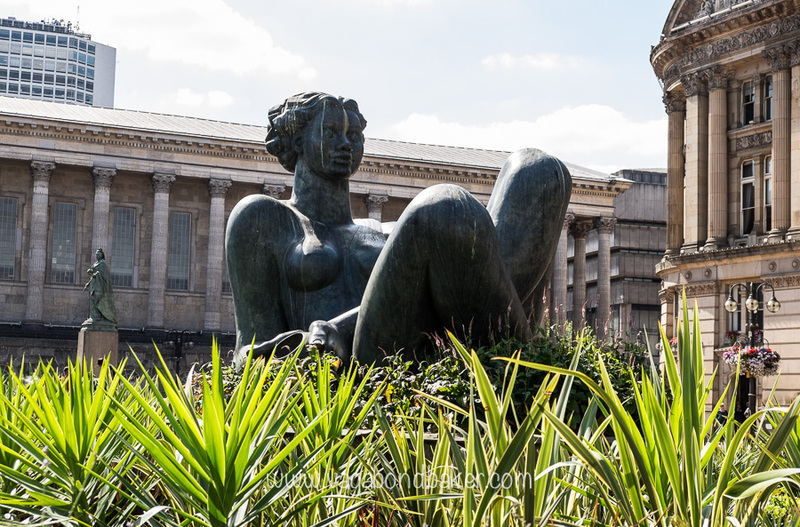 Last week I went into Brum (as we affectionately call it) as a tourist, camera in hand and a loose plan to wander. The sun was shining and the city was glowing with summery vibes. 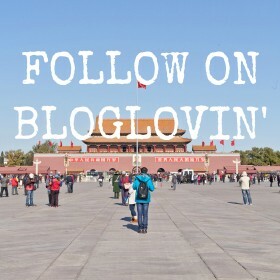 It made a change from me dashing shop to shop in a retail frenzy, I would leave the delights of the glossy new(ish) Bullring and head off for some culture instead, retread those teenage footprints and see what else I could uncover. My walk began at Birmingham New Street Station, Britain’s busiest railway station outside of London. As train stations go, New Street Station isn’t pretty (although it is getting a much needed makeover) so I’ll quickly gloss over this and head out into the street. 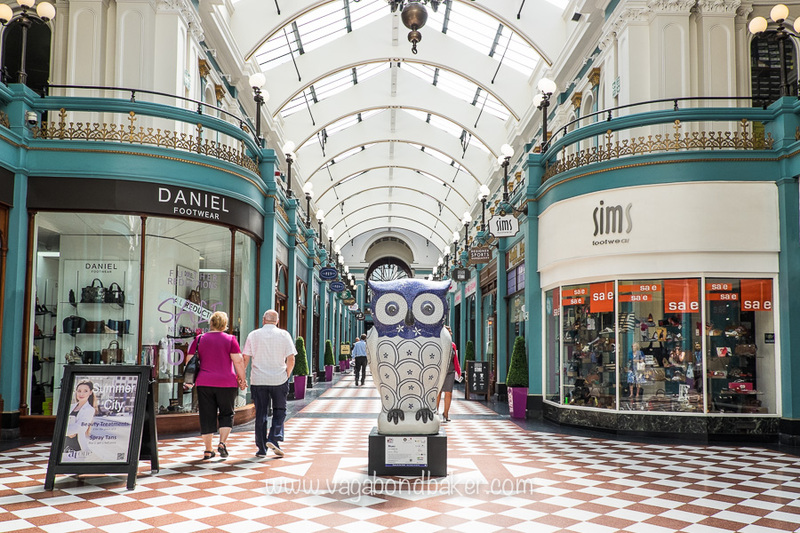 Crossing the busy pedestrian New Street, I walked up Corporation Street where tramlines are being laid, to find one of my favourite Brummie gems: the glamorous Great Western Arcade. 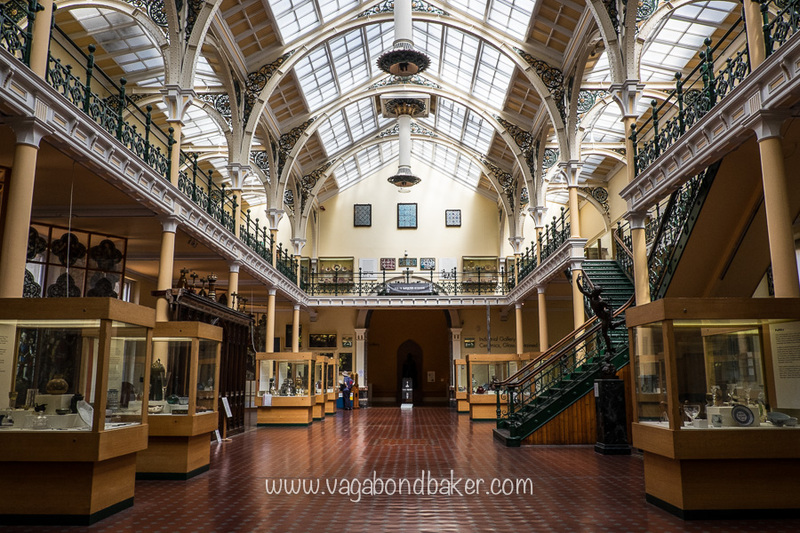 This Victorian vaulted shopping arcade is absolutely gorgeous, lined with quirky independent shops and a light, airy atmosphere, not to mention a lovely tiled floor. I reached it by walking up the more modern North Western Arcade off Corporation Street, which opens onto Temple Row and the grand entrance to the Great Western Arcade is almost directly opposite. Just to the right of the entrance is 6/8 Káfe, they do awesome coffee and their chocolate Guinness cake totally inspired me to bake one! After discovering my love of Guinness in Ireland the other week it just had to have a slice! 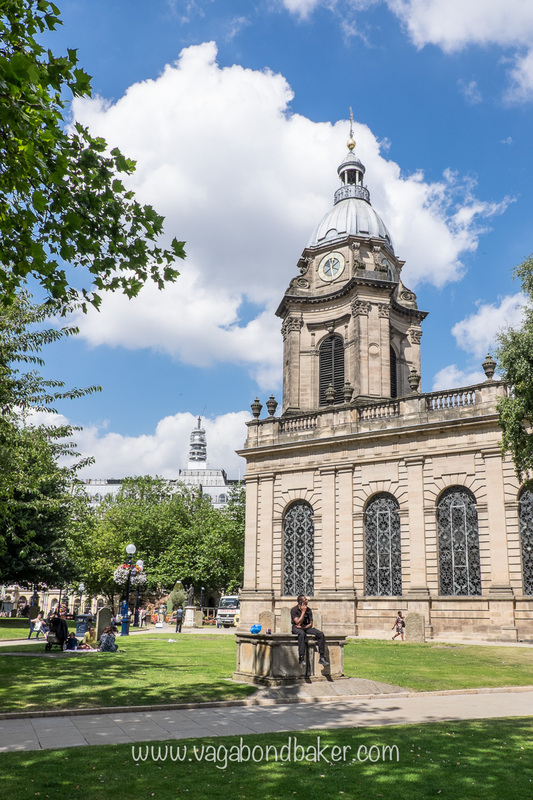 The Grand Western Arcade ends on Colmore Row and a few strides to the left brings you to the gardens around dinky Birmingham Cathedral. The green space was packed with people enjoying the sunshine, sitting on the lawns or strolling through. I remember coming here as a kid with my primary school class to wave flags at the Queen as she passed through the crowds to the Cathedral. My goodness, that seems such a long time ago now! 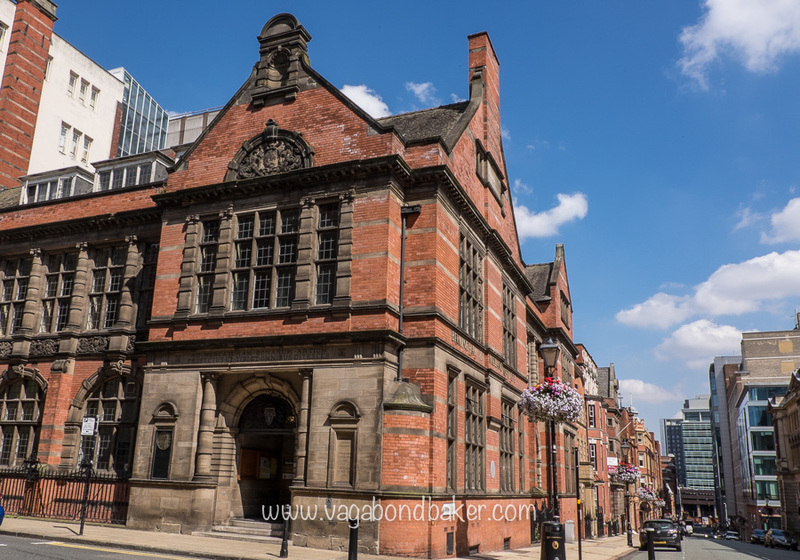 There are some lovely buildings in this corner of the city, walking through the park you can take any one of four streets to get back onto New Street but heading along Colmore Row the buildings at the back of the Council House and Art Gallery are particularly gorgeous. 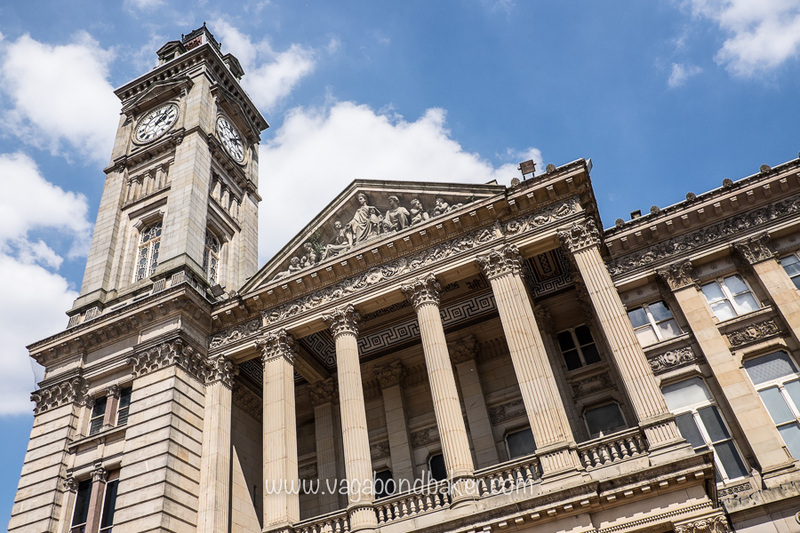 Colmore Row brings you out into Victoria Square, the heart of the city. If you are on New Street you will naturally end up here. 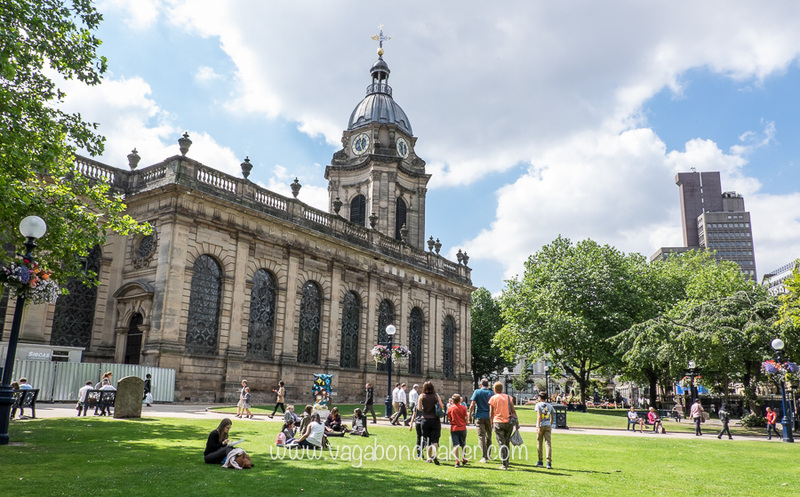 Victoria Square is a wonderful space on a sunny day: the fountains tumbling down, the fountain walls a great spot to sit. I must admit I was rather taken aback to discover the water has been replaced by plants this year. The poor Floozie (our voluptuous lounging lady) is no longer in her jacuzzi, she seems lost in the undergrowth. 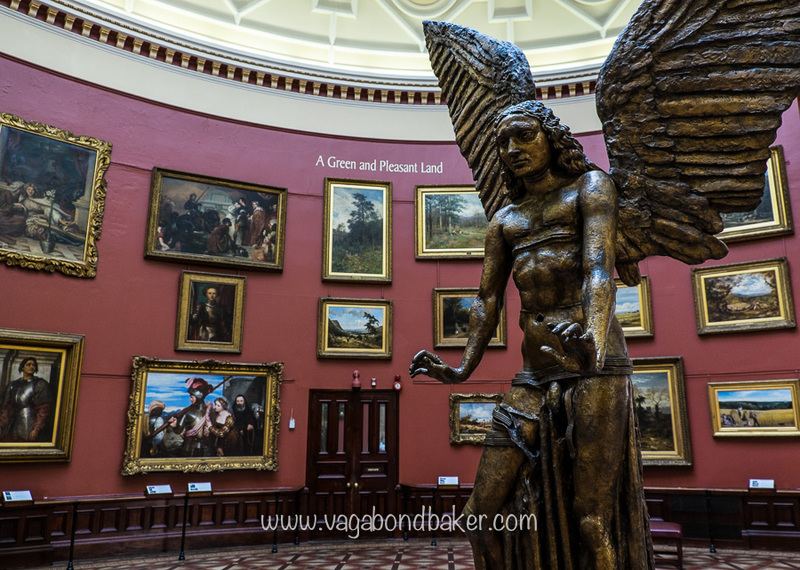 Walking across the top of Victoria Square and turning right into Chamberlain Square brings you to my very favourite place in Birmingham: Birmingham Museum and Art Gallery. 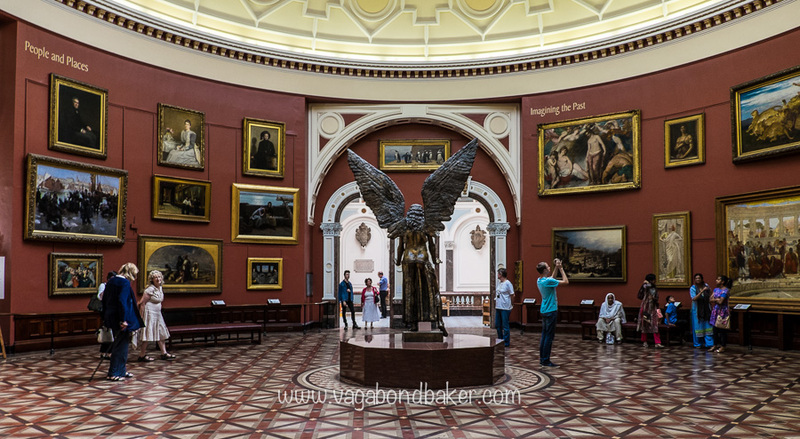 Birmingham Museum and Art Gallery is outstanding, I can credit my love of tiles, floors, Islamic architecture (from paintings in the collection), art (in particular Pre-Raphaelite art) and maybe even my wanderlust to these galleries. I wandered for hours as a teen, drinking in the exotic scenes: imagining leaving these islands forever in Ford Madox Brown’s The Last of England – this painting deeply affected the young me –, dozing on a long journey train in Augustus Egg’s The Travelling Companions, or watching wildlife in the rather lovely Dominicans in Feathers – a painting of penguins by Henry Stacy Marks. 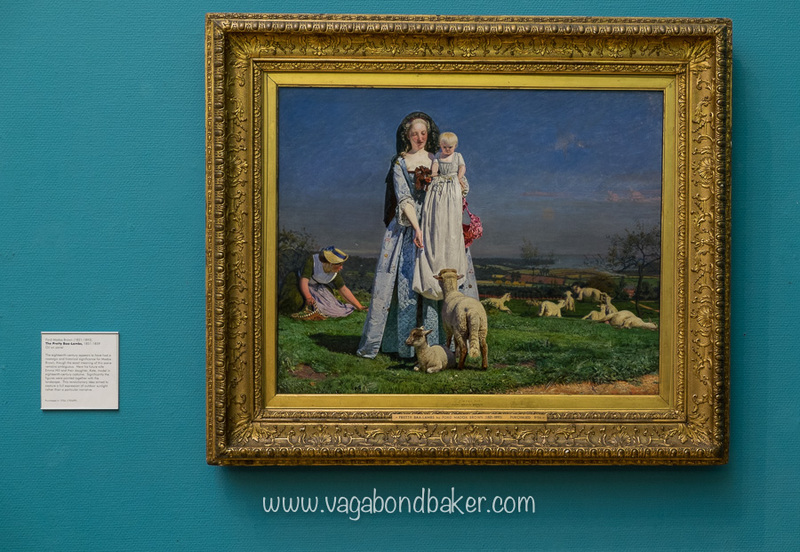 Two of these paintings are in the magnificent Round Room, which if you enter the gallery by the main entrance is the first thing you see at the top of the stairs. Standing in the centre of this red space is Archangel Lucifer; this sculpture by Jacob Epstein has bewitched me for decades. 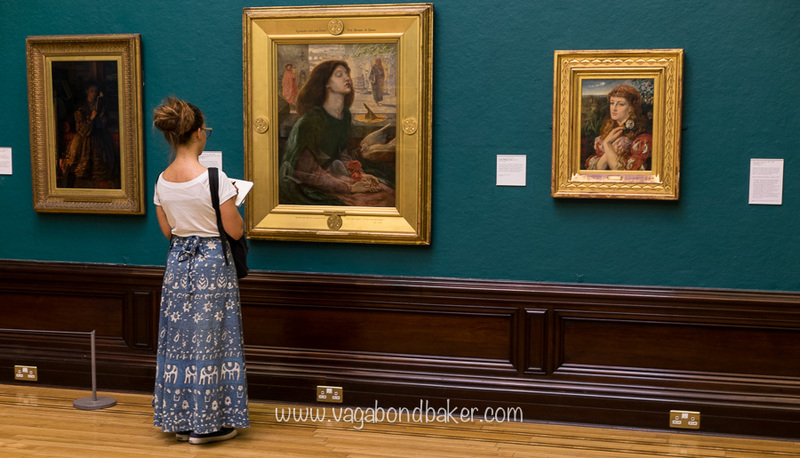 The gallery has a fantastic collection of Pre-Raphaelite art, including a large collection of work by Edward Burne Jones. I could happily spend hours in these rooms. There is a great cafe in the galleries, the Edwardian Tearooms, which have recently had a makeover. It is reached through the wonderful Industrial Gallery which in itself is a fine example of a Victorian wrought iron gallery. Just before the tearooms is the small but perfect Buddha room showcasing Buddhist, Hindu and Jain statues from India, the largest of which – the 7th century Sultanganj Buddha – was one of the very first donations to the museum in the 1800s. 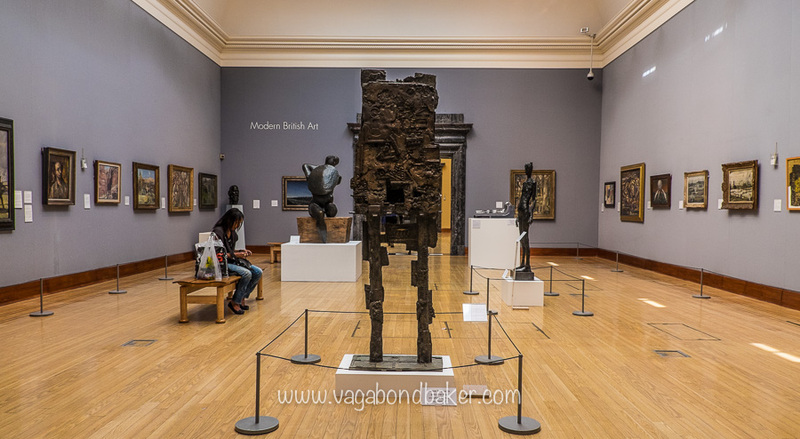 As well as paintings, Birmingham Museum and Art Gallery also has historical, local and cultural galleries. The Gas Hall under the galleries often has excellent temporary exhibitions. Leaving the gallery you can’t miss the old Paradise Forum which used to house the city library. 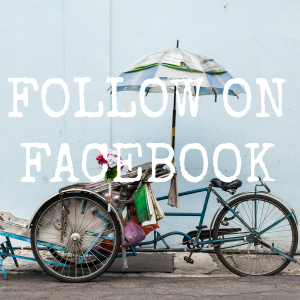 It’s due for demolition but the street art decorating it is worth a look: Todo es posible – everything is possible. There is a pedestrian passage way through the old mall to Centenary Square where the handsome new library steals the show. 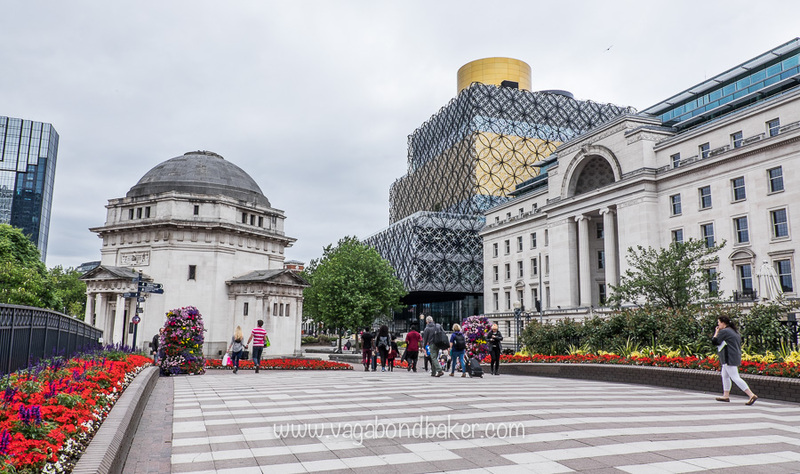 To the left is the art deco Hall of Memory: this domed building was constructed in the mid 1920s to commemorate the people of Birmingham who died in WWI. The whole square was to be built with magnificence until WWII began and the plans were scrapped, the only other building that was constructed is Baskerville House which stands opposite, right next door to the new library. 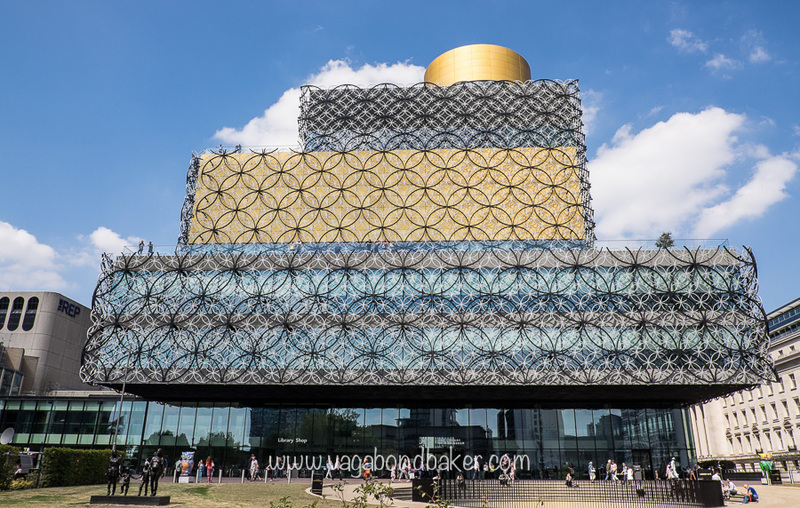 The Library of Birmingham opened in 2013 and is one of the largest libraries in Europe, it is quickly becoming one of the most visited attractions in the UK. 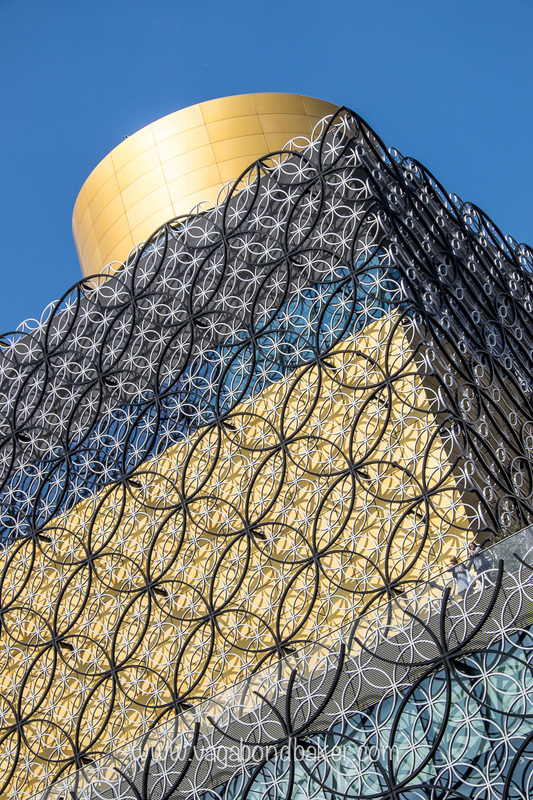 You can take a self-guided tour of this fascinating building using printed leaflets, through an app on your phone or with an audio guide (you need to be a library member for this). I’d highly recommend following the Building Highlights Trail leaflet, the library is large and it would be very easy to miss things. 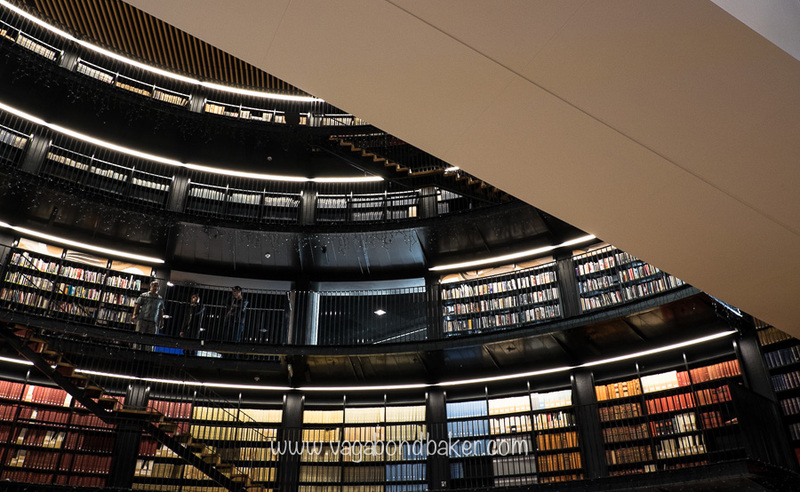 In the centre of the library rises the Book Rotunda where you can take the escalators up through the books to the upper levels. On level three a terrace runs along the whole front length of the building, a lovely garden scented with lavender and herbs. 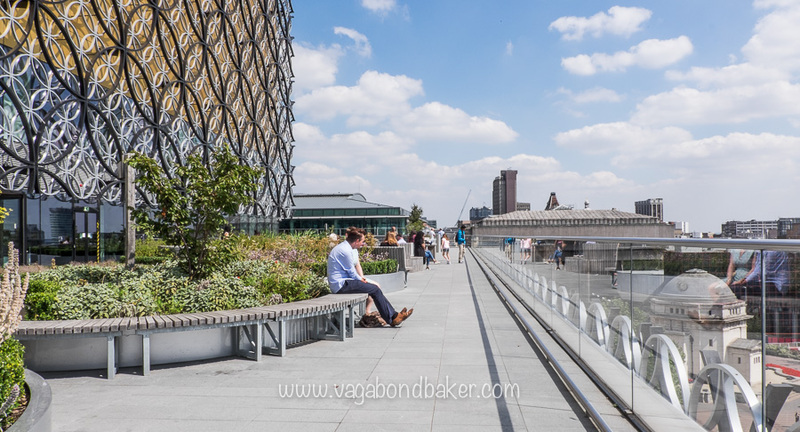 There are plenty of places to sit, read or simply take in the view over the city. This isn’t the only terrace though, on level eight the Secluded Garden is a much more secluded affair with more foliage. The highlight for me was at the very top of the library, in the golden ‘hat’. A lift up to level nine reveals the Shakespeare Memorial Room. 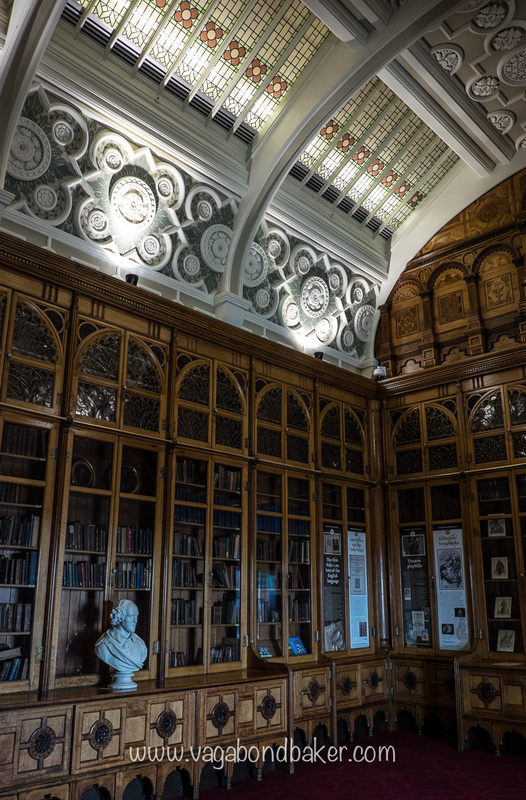 This beautiful panelled room dates from the late 1800s and has been relocated a number of times as the Birmingham library has moved locations. 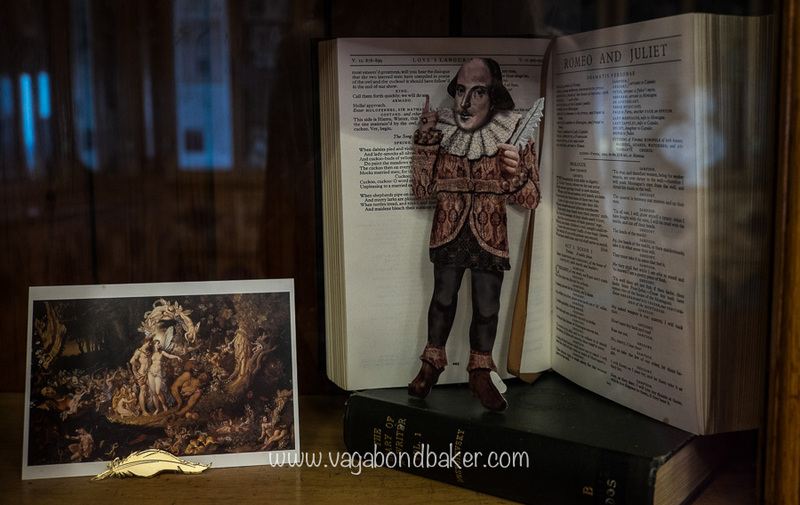 It was designed to house the library’s important Shakespeare collection and it is quite a surprise to find an Elizabethan-style room in such a modern building! The Shakespeare Memorial Room opens out onto a panorama view of the city, this is as high as you can get in the building and you can see for miles. 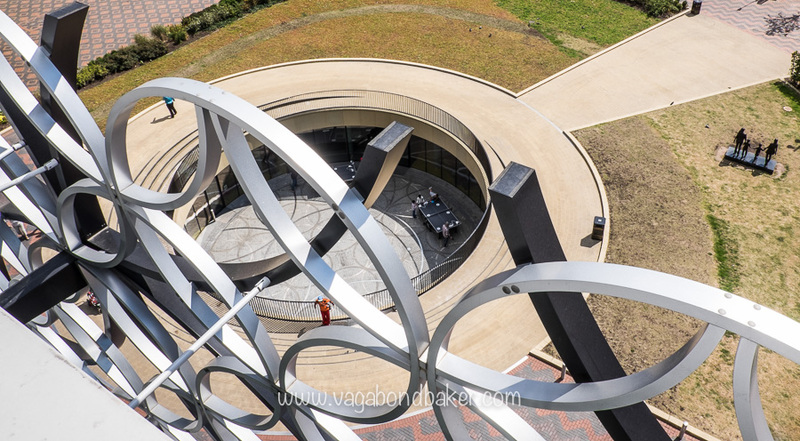 I should note here that this Skyline Viewpoint and the Shakespeare Memorial Room are sometimes closed to visitors for private functions, it’s best to check on the website before you visit. Crossing Centenary Square from the library it is hard to miss the gleam of the three Golden Boys across the street. 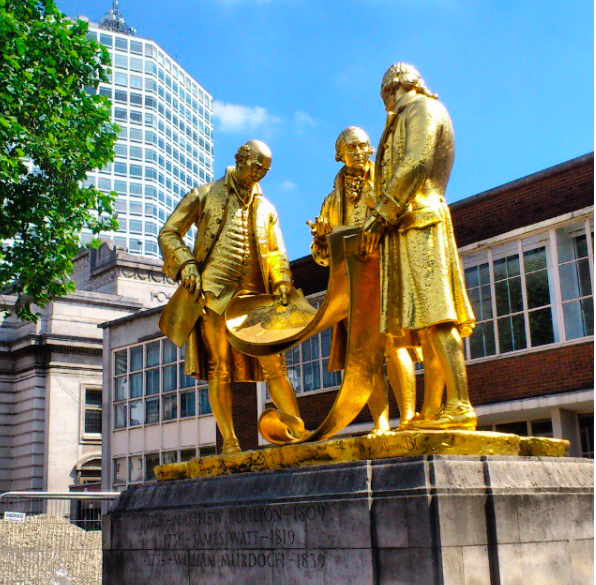 James Watt (who improved the steam engine), William Murdoch (who invented gas lighting) and Industrialist entrepreneur Matthew Boulton are celebrated here in the glitziest way possible for being pioneers of the industrial revolution. Their Birmingham-based company Boulton and Watt was a huge player in the steam engine world of the 1700s, you could say they changed the world. Turning right down Broad Street, along the side of the ICC, the road crosses one of Birmingham’s many canals, steps from the road take you down onto the towpath. I spent a while wandering along the towpaths around here, there are plenty of bridges criss-crossing the canals and it feels a world away from the modern city above. 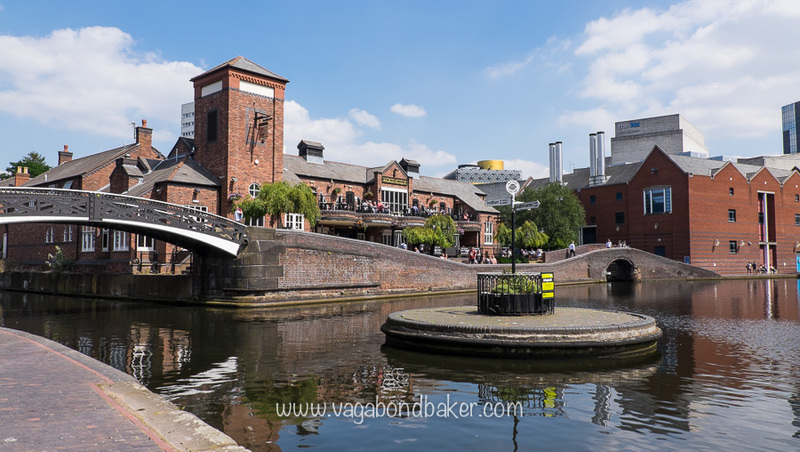 Birmingham was the hub of the canal network in the industrial age and there are still over 100 miles of canal in the Birmingham area. 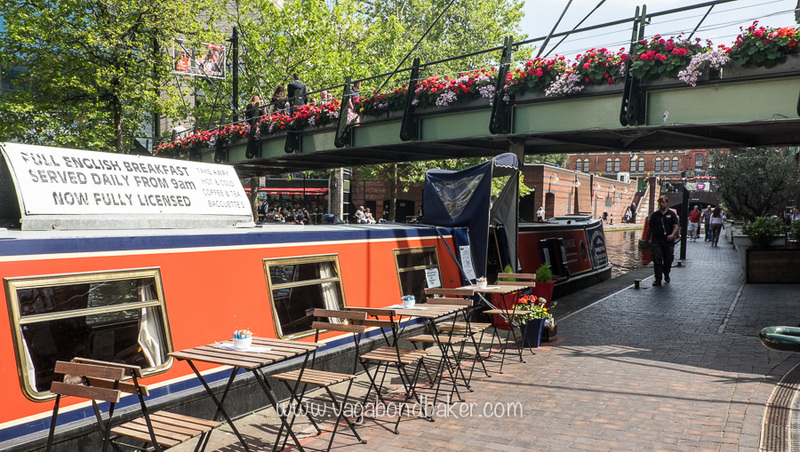 The city centre stretches are pleasant escapes: there are cafes and bars, pretty narrowboats and boat tours. 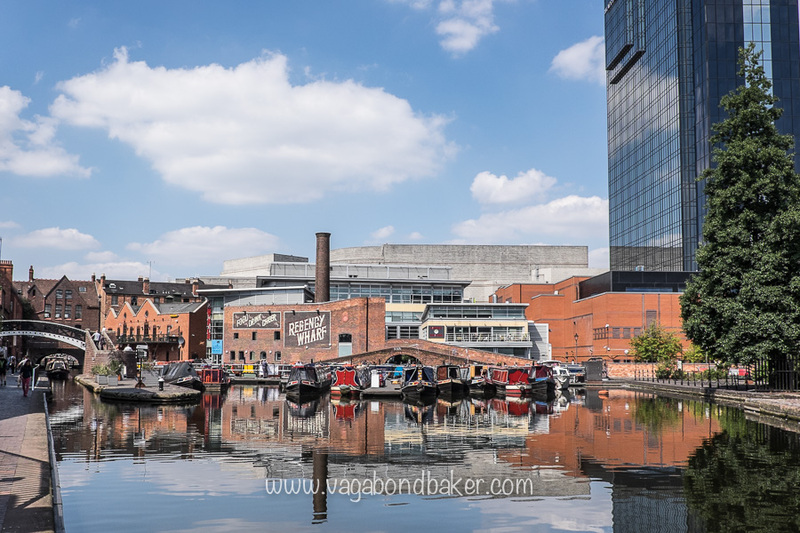 On a sunny day the light flickers off the water onto the blackened underside of the low bridges, this is a magical side to Birmingham that I could never tire of. 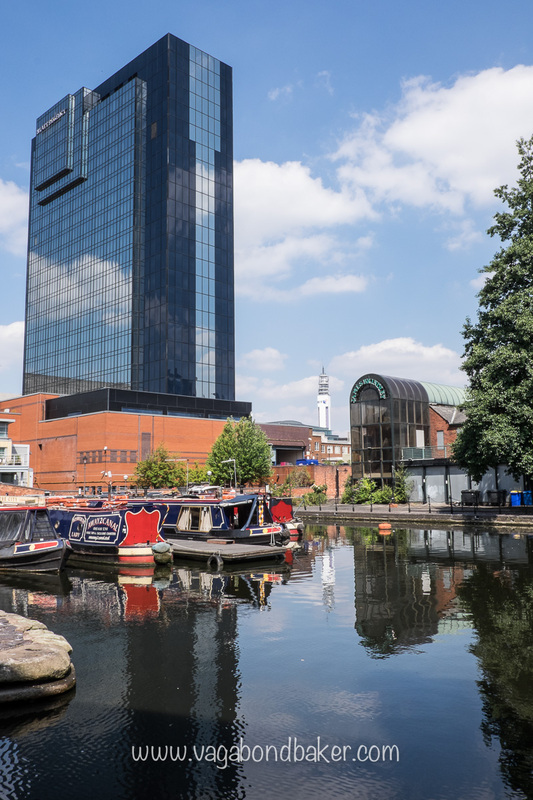 Birmingham is a relatively new city, it was a small market town until the industrial revolution when it expanded rapidly as a prominent manufacturing city. 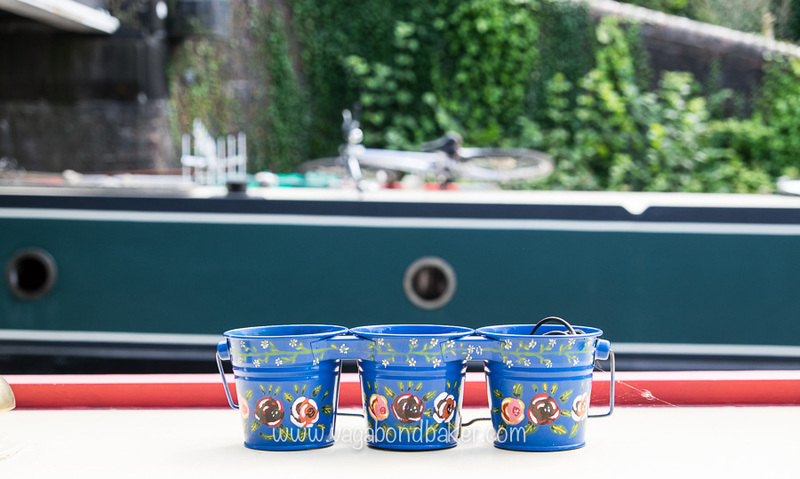 Its location in the centre of England probably helped its fate, the canal network fanned out across the country, ponies pulling laden narrowboats far and wide. These city canals to me are the birth of the Birmingham, this is as old as it gets really, and it’s wonderful! 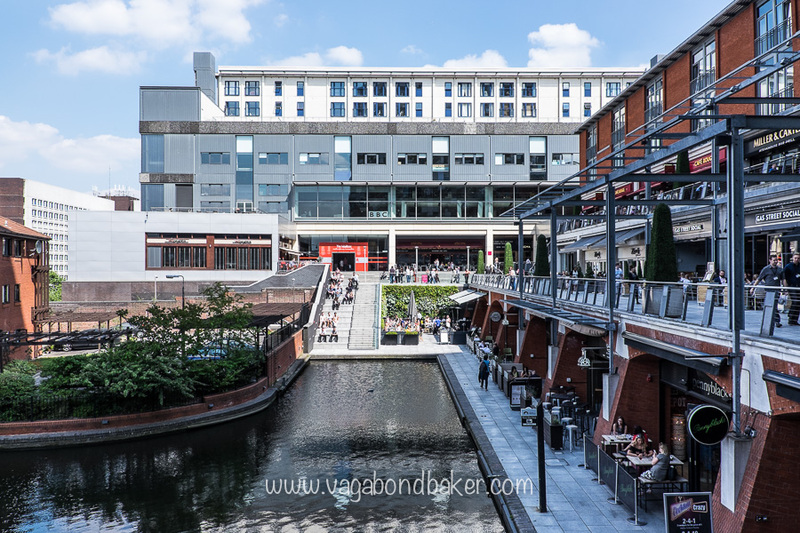 Walking south along the canal from Broad Street takes you past the pretty Gas Street Basin until it makes a sharp right, pedestrians can turn left and walk up into the Mailbox shopping mall. I walked through this upmarket temple of retail from where is is a short walk back to New Street Station. 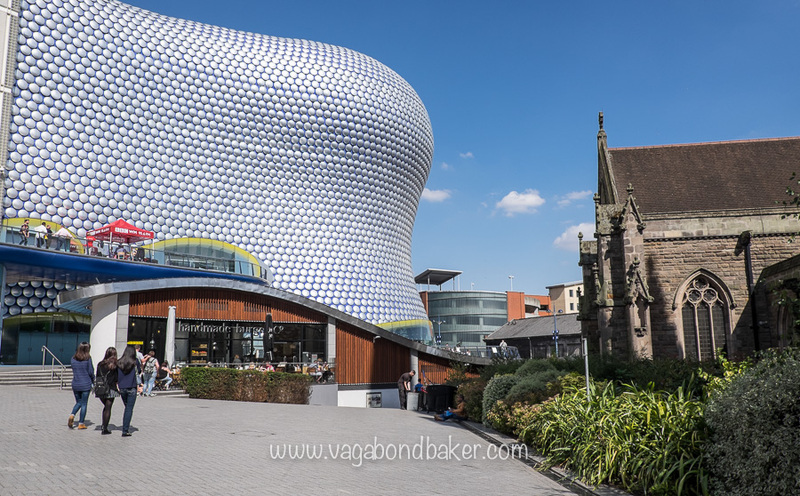 Walking down New Street to the Bullring Shopping Centre, I couldn’t really finish this post without including the iconic Selfridges building. For me, this is where Birmingham has changed the most, I can remember the old Bullring so clearly. The market place was a shortcut from Moor Street station to New Street Station. I can remember dashing through here alone one dark winter night as a teenager. I’d been to a football match and managed to miss the last train home from Moor Street. 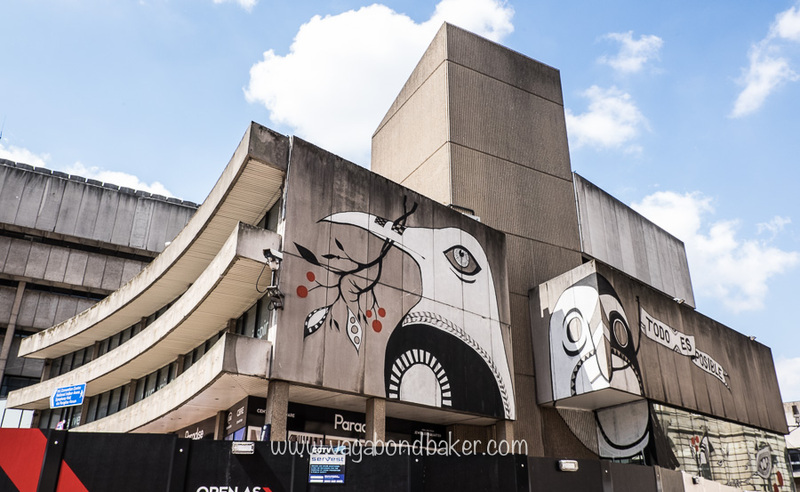 I could get halfway there on another train from New Street so I ran through the deserted market place – in full football colours –to get to the other station, I could hear a group of men running through the underpass towards me, my heart was pounding! What if they didn’t support my team, I suddenly felt like a target! I ran so fast; they took no notice of me and ran right past! No worries! 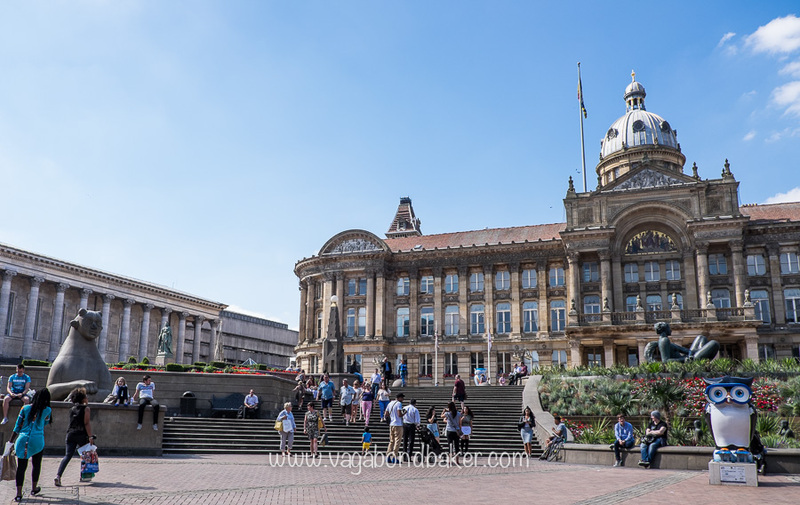 I hope you’ve enjoyed my little walk around Birmingham, it’s a super easy city to get to, it has excellent rail links, and there is plenty to see. 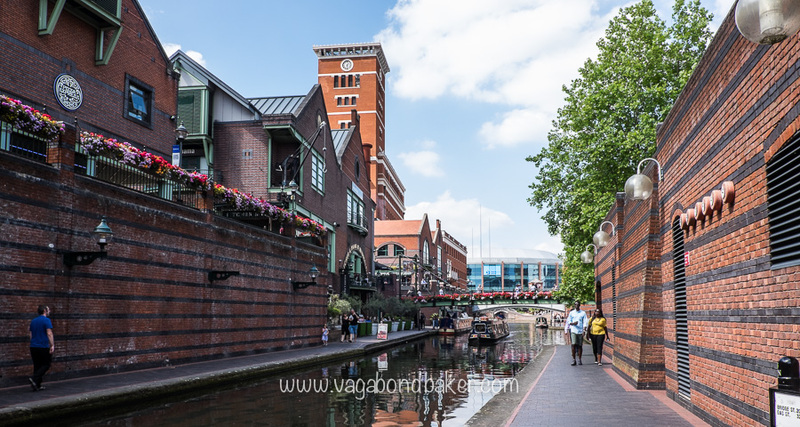 Have you been to Birmingham? Did it surprise you? Thanks Valerie! Aw, you should go back and see the new New Street Station, it’s quite a transformation! 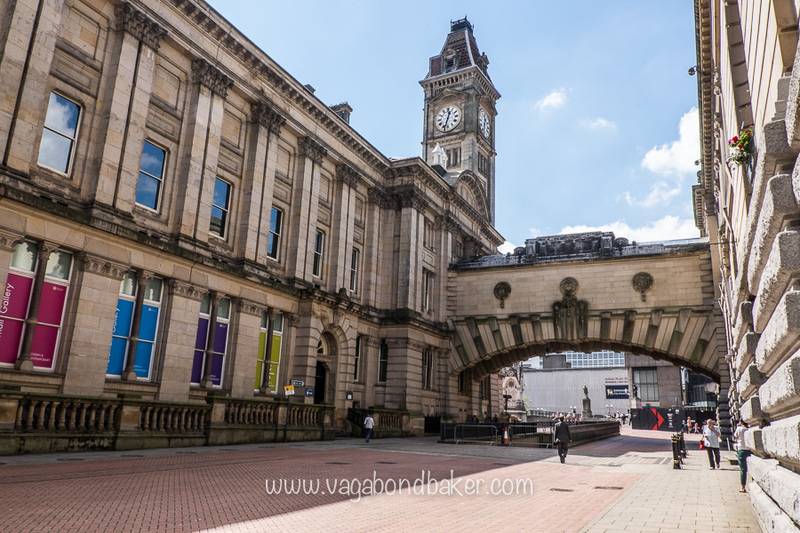 I have so many memories of my childhood, although Brum has changed quite a lot since then! Wow, I totally want to visit Birmingham now, didn’t know there was so much cool stuff there! 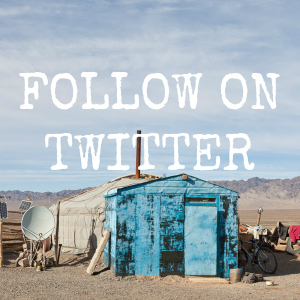 I think I would like the art museum and canals the most, especially those wanderlust-inspiring paintings you mentioned and all the narrowboats on the canals. And I really like the new library building – that’s the kind of architecture that makes some people love it and some hate it. What do Birmingham people think of it? If you come back over I’ll give you a tour there! It’s fantastic! I think the Brummies love it, and are very proud of it. 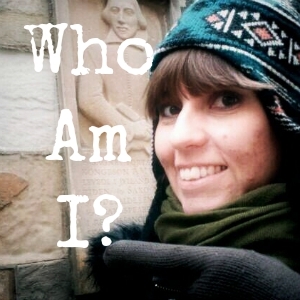 I certainly am! 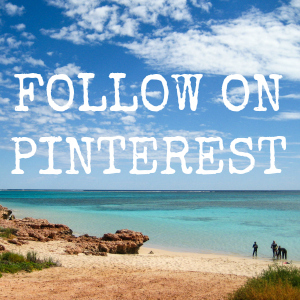 That looks like a lovely place and the weather you were blessed with? Wow! I think I read somewhere recently that above the shops in the Great Western Arcade are apartments? Do you know anything about that? I waited for good weather to head into town! I don’t know if there are apartments, I wouldn’t be surprised, it’s part of a big building!